The medal recognises the contribution of David Hugh Trollope as one of the pioneers and leaders of Australian geomechanics research and teaching. This was initially at University of Melbourne in the 1950s and early 1960s, then at James Cook University of North Queensland. Hugh Trollope was renowned as an eloquent, inspired and indefatigable leader of fundamental research, especially in the application of discrete particle mechanics in geotechnical engineering. Prof Trollope, like his long-term friend and adversary, Professor Ted Davis of University of Sydney, was one of the original pioneers of Australian Geomechanics teaching and research. The award may be made every two years, provided a suitable nomination is received. The Trollope Medal is awarded to the author of an outstanding paper on either theoretical or applied geomechanics. The work reported in the paper must have been undertaken in Australia by an author under 35 years of age and can have been published anywhere in the world in the previous four years. The nominated author must have been primarily responsible for the work and would normally be the principal author of the paper. The paper must be based upon recent or current doctoral research undertaken by the author. The recipient is expected to be a member of the Australian Geomechanics Society. The nomination can be made by any member of the Society. The nomination requires the approval of the author and should be accompanied by two copies of the paper. The nomination is to be accompanied by an electronic (disk or USB) copy of the Doctoral thesis, which will be returned following the selection process. The nominations should be forwarded to the Secretary of the National Committee following a call for submissions in Australian Geomechanics Journal . Nominations will be called every two years, normally in the alternate year to the EH Davis Memorial Lecture. A sub-committee of the National Committee, promulgated by the National Chairman, will judge the nominations. The winner will present the nominated paper at a suitable conference or group meeting. 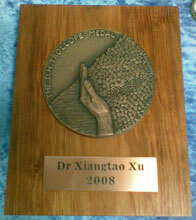 The award is in the form of an inscribed bronze medal. It will be presented to the winner by the National Chairman, or a designated representative, at a mutually suitable time and venue. The paper may be presented to other Chapter meetings, subject to individual arrangements.